...One very import issue remaining the IMMEDIATE issuance of the restraining order. I would like this filed with the court today. 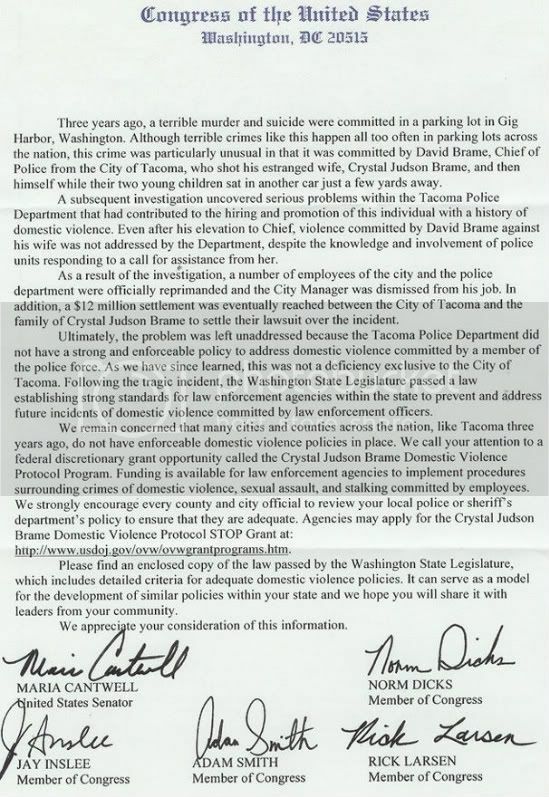 I have been informed that the Tacoma New Tribune is running a story on this divorce, and its many issues court documents. I feel this is extremely important that you are aware of this. I strongly fear for my personal safety, and I am strongly requesting that the restraining order be put in place today. There is already information about this divorce on the internet. My concern is when the respondent returns from his Las Vegas trip he will come after me. I am pleading with you to please put the restraining order in place immediately for my personal protection. Regarding mutual restraining orders... I would like to speak to you about that. Can't Mr. Brame request one on me on his own? Why would I want to request one on myself? "Dr. Knauss, this is Crystal Brame. If you could give me a call when you are available. It's about 4:35 on Friday afternoon. I was told you probably not in, that you weren't in today. If, when you get this message, if you could call me I would appreciate it. Uh, if you would call my parents' number at (phone number), I would greatly appreciate it. I need to discuss with you some recent things that have happened and, uh, at least to let you know. Also in today's paper, if you do have copies or can get a copy of the Seattle P-I and on the Internet and nwcn.com for Northwest Cable News. (cough) Excuse me. Pardon me. I got (unintelligible) into Northwest News and the article. David had called me just last night and he'd hung up on me two times, uh, stated he would trash me in the newspapers and that's exactly - these articles are not very, um, flattering to say the least. But anyway, uh, it is in the newspaper now and he has told me and warned me that he hasn't even begun yet, that I haven't seen anything yet. So I do still have concerns, since the restraining order is not in place yet. Um, his attorney is back East and they need a representative apparently to be at the courthouse with Joe, won't return calls. So Joe was not be able to enter anything in the way of the personal restraining order. So, I'll be back and forth still at my home. I need to stay there a few nights. I have to establish that I am living there. And I still have a great concern, a greater concern now for my personal safety now more than ever. Um, anyway, if you could call me at your convenience I would really appreciate it. Again, try my parents' number at (phone number) or my mom's cell phone at (phone number). Um, and I would just - I'll look forward to hearing from you. Have a great weekend. Thank you so much.